The same author who wrote American Frugal Housewife penned this guide to raising children. For anyone who has examined that title, it would be a fair guess that the advice provided in this book for mothers would be relatively conservative. 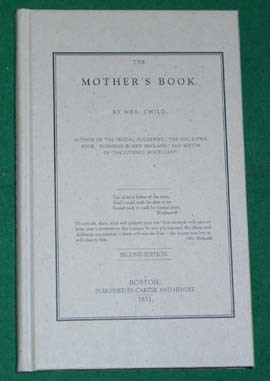 Because this is a "mother's book," it does not contain any advice any advice about household management, cooking, or other aspects of maintaining the home. Instead, it is focused completely upon the nurture of children from their earliest experiences through the Teens and culminating in a brief discussion of marriage. There are chapters devoted to such topics as Early Cultivation of the Intellect, Amusements and Employments, Sunday/Religion/Views of Death/ and Supernatural Appearances, Politeness, Beauty/Dress/Gentility, Management during the Teens (thirty pages! ), and Views of matrimony. A lot of the precepts presented by the author are recognizable as the same principles people heard from their parents but still advocated in modern advice for parents, albeit under different names. Some elements are dated, e.g., a listing of suggested books for children to read, and of course there is no advice on how to handle television, computer use, and other issues of modern life. And for reenactors who chafe at some of the dissheveled hairstyles seen in movies and television programs, there is even the statement that "smooth, well arranged hair,... give a genteel, tasteful appearance to the whole person." However, can we guess that, if such advice were offered, that there were abundant examples of the contrary in society, so maybe the poorly arranged hair had some basis in fact?